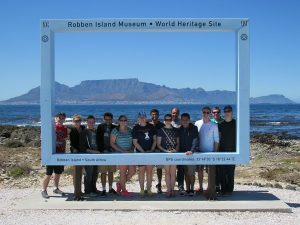 The Global Leaders’ first weekend in Cape Town concluded with several more cultural adventures; the first of which was Robben Island, a 1000 acre island located 11.2km from the shores of Cape Town. 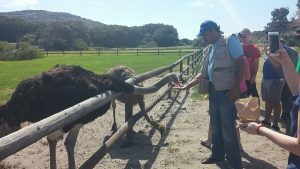 Before going into detail about the tour, it is important to understand a little bit of South Africa’s history. Shortly after World War II, the South Africa government created segregation laws and a racial system known as the Apartheid which in the Afrikaans language literally means “the state of being apart”. For years, the country of South Africa had been racially segregated by the Dutch Empire, the British and during the Apartheid by the League of Nations. Three main racial groups were victimized during the Apartheid; Black, Indians and Coloureds (pretty much anyone else who is not white). If any members from these groups were convicted of acts against the government, they were sentenced to prison located on Robben Island. Of the many imprisoned, Nelson Mandela was one of them serving 18 of his total 27 years on Robben Island. The Apartheid ended in 1994 and Robben Island is no longer a prison, but rather a monument of the struggles many South Africans went through. 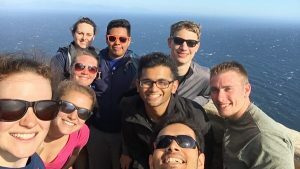 The tour began with a ferry ride out to the island displaying a beautiful view of Cape Town from the ocean side. Once docked, we took a bus tour around the island to see the small Robben Island community that people still live in today. 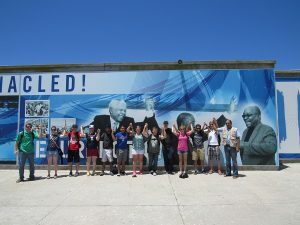 The most fascinating part of the tour began when we arrived at the prison and was able to learn about Tom Moses’ firsthand experience as an inmate from Mr. Moses himself. Even within the prison system segregation was still enforced where Blacks were treated much more harshly than Coloureds and Indians. 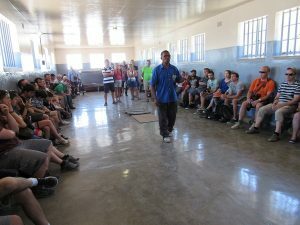 After viewing the different cells we slowly walked back to the ferry down the path referred to as the Long Walk of Freedom; the same path freed inmates would take to come home. 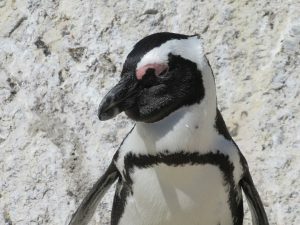 Next stop was at Boulder Penguin Colony in Simon’s Town. Yes, you read that correctly. 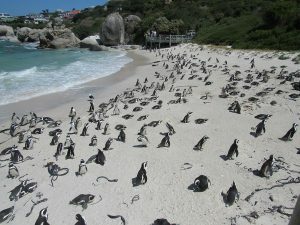 Although endangered, African Penguins do exist in a few locations along the beaches of South Africa. African Penguins are the only species of penguin breed in Africa. Unfortunately our visit at Boulder Beach did not last much longer than a couple of pictures due to high winds pelting us with sand. 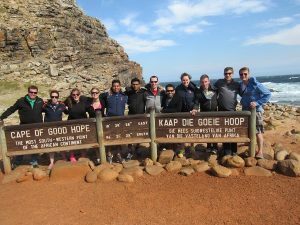 The last of today’s site seeing ended at Cape Point and the Cape of Good Hope, commonly known as the southernmost point in Africa. 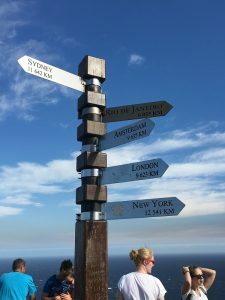 Once we hiked trough the blustery winds up to the peak of the Cape Point mountain the view was nothing less than spectacular.